Last week shoppers in Carlisle may have thought they were going mad as they were treated to unusual happenings! With hat trick demonstrations, live mannequins, living statues, and dancing madonnas!! It was all in aid of 'Living Windows' celebraiting 25 years of The Lanes Shopping Centre in Carlisle City Centre. The performers, students from the University of Cumbria, looked stunning and worked hard to achieve the look...thanks so much for your time and energy guys! ...Watch out for more events like this later in the year! If you would like to be involved with any of our projects visit www.danceahead.co.uk for further details. Saturday 18th Sara took to the stage in The Lanes Shopping Centre in Carlisle and presented 'Hat Tricks' providing some great ideas for ladies night at Carlisle Races. Sara showed ideas for re trimming old hats and creating a fascinator with the trimmings! 'Old Hat' in Newspaper, Flyers & Wire. On Thursday 16th July 'Old Hat' went on display at High Head Sculpture Valley. This latest collection of headwear has been inspired by a recent period of work undertaken with Grampus Training and Heritage Limited, a local company who work with students from all over Europe. Sara has been increasingly interested in the potential of using recycled materials to create exciting new pieces. Sara adopted a simplistic approach to create the designs, drawing upon personal skills and problem solving to transform recycled objects into ‘something else’. Each creation has been inspired by the recycled object in its original state with minimal use of additional materials. The potential for recycled fashion is endless! Any body wishing to try their hand at creating something from nothing can enrol on a new ‘Fashion Junkie Workshop’. Participants will have the opportunity to make their own exciting creations from recyclables! Or if you’d like a more traditional approach you can try Retrimming an old hat at an ‘Old Hat Tricks’ workshop; the next one is Saturday 22nd August 10am – 4pm at The Studio in Corby Hill near Carlisle. Here are some of the latest creations that have been adorning the heads of stylish ladies across the country and even the world! 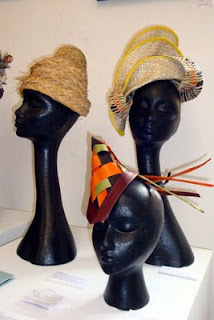 If you would like to commission Sara Gadd Millinery to design and create an exclusive hat for you visit http://www.saragadd.co.uk/ for further details. During this recent workshop I worked with students from all over Europe at Grampus Heritage and Training Ltd. We produced hats made from a mixture of natural materials such as linen, raw silk, fur, hand made melt, woor , bo ne and metal.